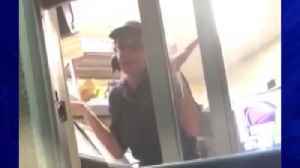 A video that went viral on social media showed a Taco Bell worker using the name Luisa arguing with a customer trying to place an order. The worker keeps insisting that she not speak English, and asks.. 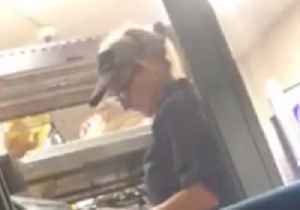 The woman who tried to place her order Wednesday night and finally had to give up has received an apology from the company and says the employee who refused her order has been fired. 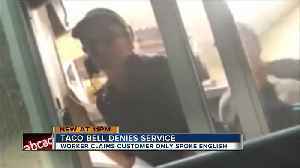 ▶ Videos for "Florida Taco Bell"
An employee at a Taco Bell in Hialeah, Florida, has been fired after she refused to serve a customer who spoke to her in English on September 13. 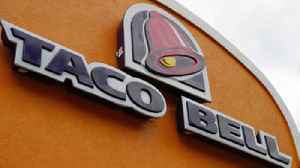 A video shared to Facebook by Alexandria Montgomery..
A woman is complaining she was denied food at Taco Bell because she did not speak Spanish and the employee did not speak English. 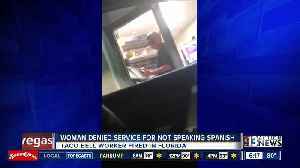 A woman says she was denied service at a South Florida Taco Bell because she did not speak Spanish.